Embark on an incredible Irish adventure with a unique 14-mile tour through County Kerry. Set out by open boat from Killarney National Park's 15th-century Ross Castle, passing islands and beneath old stone bridges along the Lakes of Killarney. 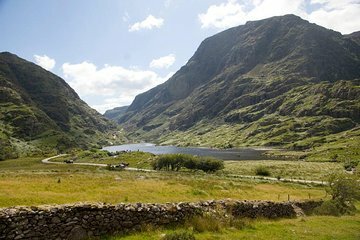 Then continue via pony-drawn carriage through the remote Black Valley and the narrow and winding Gap of Dunloe. Meander through this stunning mountain pass, marveling at a handful of scenic lakes and crossing the Wishing Bridge en route to the family-run Kate Kearney’s Cottage, where you'll catch a bus back to Killarney. Experience included a small boat ride up the lakes with a fun and funny local boat driver and a cart and pony over the gap with interesting stops along the way. We went in the direction starting from Ross Castle so had to get a cab ride there but on the way back at the end of the trip the driver stopped in Killarney, a short walk from our hotel. Actually enjoyed this more than the more popular Ring of Kerry. Recommend them both. If I could give it a ten I would! this was spectacular! We were late for the tour, thinking that it started at 10:45, when it started at 10:20, and we were walking running, really there from town. It is a long walk. Laura called us, and came to get us in her personal car!!!! Outstanding service!!! We started with the boat ride through the three lakes and two rivers with Dux! Awesome man! The water was beautiful and quiet. So serene!! then we met our trap driver to go thru the Gap. His name was Patrick, and he was wonderful and very funny! I read various reviews saying that the drivers didn't talk and it was boring...... No way!!!! Take the trap. It is a 7 mile walk and very hilly. Such amazing scenery! This is one of the best things that I have ever done while traveling!!! A must Do!!!!!! A fantastic experience, entire family including teens loved it, would recommend it to anyone visiting Ireland. This a must do for anyone visiting Ireland and Killarney. The boat ride across the three lakes was beautiful. Water was a bit low, very unusual for Ireland, so we had quite an adventure going from one lake to another in the boat. The jaunting cart ride was awesome! An experience you don't want to miss! Thanks Darcy! We had a bit of bad luck with the weather on the day of this tour, but both operators for each leg pony/trap and open boat went above and beyond to make this as enjoyable as possible. Would definitely recommend! The first part of this tour was very disappointing and unacceptable. There were 8 of us in the group. 4 went in one trap and the my 4 went in another. the 1st group was very satisfied. Our horse drawn trap was driven by an elderly woman who spoke only to the horse. No explanations or points of interest were ever given to us. We were so crammed in the trap that the lady was actually sitting on my hip most of the way. Half way up the hill, she wanted all of us to get out and walk so the horse could make it up the hill. This is all happening in pouring rain. Once we got back in, the rein on the harness broke. She had to pull some rope out of the plastic tarp which we used to keep from getting soaked . She used to rope to tie the rein to the harness and told us we had to go very slow so she would not lose control of the horse. At this point she stood in the trap. The reins kept hitting one of the men in the face and each time the driver used the whip, we had to duck so as not to get hit by the whip. We were so glad when we arrived at the end. We really spent most of our time keeping out of her way and trying to stay dry. The boat ride across the 3 lakes back to Ross Castle was interesting. All in all, not a fun trip. Great trip. If you are so lucky that your trip is organized by Laura, you will fine a highly professional organizer and a very kind person. This tour was amazing! I highly recommend this way of exploring the Killarney National Park. Not only are you seeing a beautiful place, you are experiencing it in an authentic way. Our guides were great! Don't miss out on this tour! This tour was a fantastic way to see the National Park. I would highly reccomend this tour!